Last year I found the perfect mid-century pinch-pleat draperies at JC Penney. Pam at Retro Renovation said her readers found them to be a good source. At Christmas my parents gave me a gift certificate to JC Penney for so I could buy some . . . and JCP immediately stopped producing the style/color/length I needed. 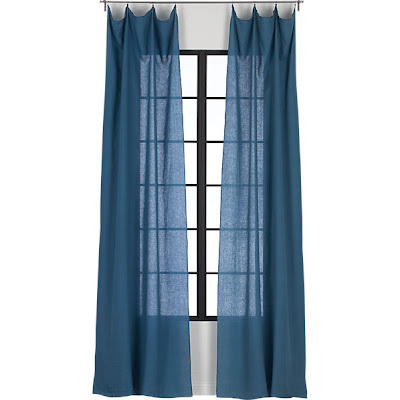 So I've been buying (and returning) curtains left and right, trying to find something I liked. 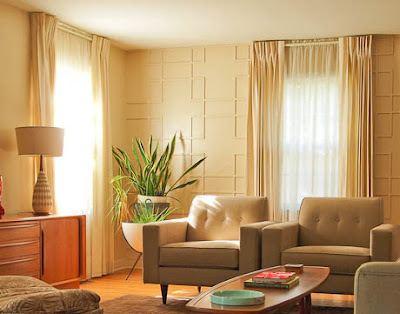 Then I saw this post on Emily Henderson's site about where to find cheap but good curtains. I liked these "French-Belgian linen panels," but at $60 a pop I'd need to spend $600 just in the living room. I am so sorry for these terrible photos. Do you know how hard it is to photograph a window with natural light streaming through? I picked up some "linen-look" tencel fabric, which is dyable, and used a rolled hem foot to zip a 3mm hem around all four sides. 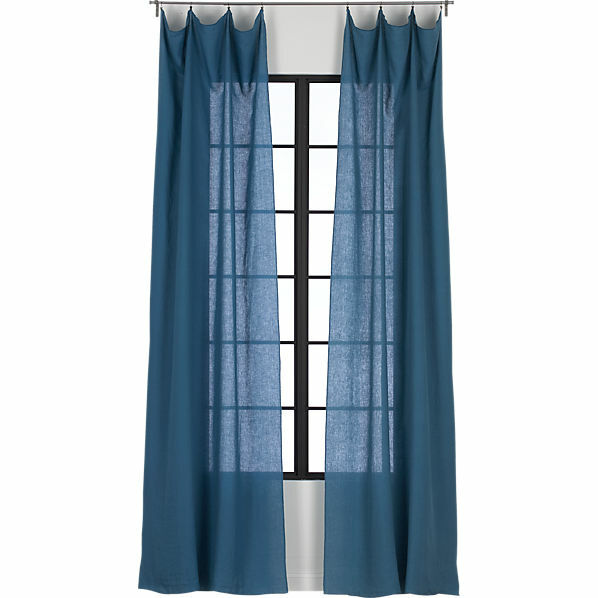 The real deal will be a floor-length panel with a more substantial curtain rod. I have an Ikea Enje blind behind it, which is wonderful during the day but it provides zero privacy at night. I wonder if all the people who have installed Enjes in their house realize this? Wait for the sun to go down, turn on your lights, then step outside and see your life on display. So now I start the laborious process of doing the prep work for a bunch of panels. The fabric is so thin and malleable that it has to be starched and ironed (and any stray threads trimmed) before running it through the rolled hem foot on my sewing machine. My hope is to get one panel prepped after work each night, then sew like crazy this weekend and get them hung. I figure that gives JC Penney enough time to magically start producing the pinch-pleat draperies I wanted in the first place. EEK! I worry about the night-time-see-throughness of my shoddy window treatments. They've just been thrown up 'for now', but as I've considered buying something 'real' I'm stunned at the price, especially since I have something like 15 windows. Bother. Yeah, window coverings are freaking expensive. We have a zillion windows too. I like the look of these way better than the pinch pleats. JCP, eat your heart out. One great thing about the country: only the deer and the raccoons are in any position to see in, so we don't have to worry about window coverings. Yay! You shouldn't be blocking the view to your gorgeous gardens anyway! Wow, for a second I thought that first picture was actually your house. When I bought my small ranch house in Spokane I discovered old (original?) linen pinch pleat curtains in their dry cleaning bags in a closet. I was ecstatic, then I discovered the moth holes. Still I was able to find a good panel that fit my bedroom window. Funny I packed it and brought it with me to Portland, that's how much I loved that thing. Damn JC Penny. Whatever will you do with your gift certificate? Oh, that's such a tease! I figure I'll use the gift card to buy the hardware. That stuff adds up quickly, so it should work out well. That first picture...my mom & dad's living room looked like that for 50 years. I wish I'd saved her curtains for you.